f one of the products reviewed here could be called “the Swiss Army knife of PS3 infrared to Bluetooth converters”, then it’s without a doubt the IR2BTci. But like genuine Swiss Army knives the IR2BTci doesn’t come cheap with a price tag of $150 USD. The “ci” part of the name refers to “Custom Installers”, and it’s to that target market that the sophisticated IR2BTci warrants its cost by going above and beyond traditional converter capabilities, with value-added features that turn it into a kind of “mini system control center”. With big power comes big size – at least comparatively speaking. The IR2BTci may be the largest unit in our roundup, but it’s still rather compact as far as home theater devices go with measurements of 4.50” wide, 1.25” high and 3.0” deep (11.4cm by 3.2cm by 7.6cm). Ports, ports and more ports! 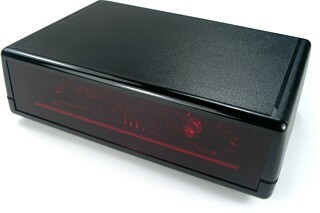 The front of the adapter is dominated by a huge transparent plastic shield, behind which you’ll find the infrared receiver, an infrared emitter, plus two small (but bright) red status feedback LEDs. The back of the IR2BTci holds the largest collection of ports of any adapter in our roundup: USB power sense input, AC power sense input, RS232 output, external IR input, combination USB communications and power input, plus a tiny [Boot] button. Thoughtfully the IR2BTci comes with an optional set of 4 soft rubber feet, to help prevent it from sliding around with so many potential cables connected. There’s only one way to power the IR2BTci, and that’s through the main USB port. You can hook it up via a standard USB cable to any device that supplies constant USB power (such as some set top boxes – but of course not the PS3 itself), or for $10 you can buy the official AC-to-USB power adapter. All configuration of the adapter is done using a Windows PC and software downloaded from the official website. The unit does require a custom driver, but the software installation took care of everything automatically. After connecting a USB cable to the IR2BTci’s [Power] port, it’s necessary to press the tiny [Boot] switch on the back for about 4 seconds with a paperclip to get the unit to connect to your computer. Once connected, the two status LEDs on the front flash back and forth. 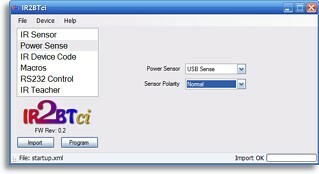 The software’s interface is simple, with a list of configuration items on the left and matching settings on the right. It’s possible to save and load custom settings from disk, or import existing ones from a connected adapter. As with most other adapters in this roundup, the IR2BTci uses the stock Sony DVD codeset with PS2 extensions by default. Three other Sony DVD-based codesets are also listed, and it’s additionally possible to specify a completely custom codeset based on any valid Sony device number. 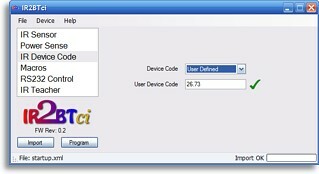 The IR2BTci remaps all PS3 functions to the custom device number, so multiple adapters can operate without conflict in a single system. One of the tricky parts of dealing with custom codesets is actually getting the codes into your remote. Instead of spending time generating Pronto hex and then figuring out how to convert it into whatever format your computer programmable remote needs, the IR2BTci has the ability to transmit all codes directly from the adapter. Simply set the software to the codeset you want it to recognize, switch to “IR Teacher” mode in the software, select a command, and the unit will blast out the code – to be captured by absolutely any learning remote control. This feature isn’t perfect, however, as it only sends a short burst of the command rather than the sustained hold that most remotes prefer for learning. For receiving infrared commands, the IR2BTci includes an internal infrared eye, or using the software you can switch to the external IR port for a hard wired connection with any industry standard IR distribution system or RF remote basestation.